Happy December! We're getting our tree this weekend and its high time I write my Christmas cards. I love the notion of sending things all year round, cards for birthdays, for thank yous, for little notes just to say hi - but I know the festive time is when people do it most. I love the traditional aspect of it all - it feels a lot more personal than sending a text or email sometimes. No matter what it is you’re sending, I’m sharing a really simple DIY that adds an extra special touch. I’ve mentioned it before, but I always make my cards, and, whether they’re homemade or not, lining envelopes make them look so much more fancy, and I definitely recommend it! It’s actually really easy to do and makes it feel that little bit more unique. All you’ll need is some paper that you’d like to use for lining and the envelope the card is going in. You can use any paper you like - brown or patterned, even newspaper or wrapping paper. The thicker the paper, the easier it is to slide in, but be sure to score the fold line well or the envelope will struggle to close. Take your envelope and measure the width. Minus 2cm off this figure and measure that out on your piece of paper. 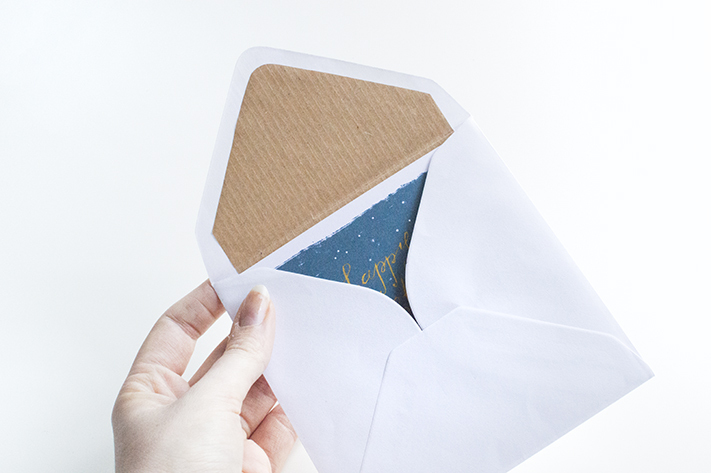 The insert doesn’t have to be the full height of the envelope, only enough so you can’t see the edge when your recipient opens up the flap. I measure approximately an inch up from the bottom, or about where the paper meets in the middle section of the envelope. Line your envelope up in between the width lines you just made. Trace around the shape of the top of your envelope and cut out your shape. Before we glue it down, we’ll add folding to make it easier for the next few steps. Place your piece inside and align it to the envelope. The top edges will sit in the middle, which is the 2cm we took off earlier. Holding the pieces together firmly, fold down the top flap and both pieces of paper. Bring the envelope flap up, and press the fold of the lining to make sure the fold is nice and sharp. Glue around the edges of your paper with either a glue stick or a tape runner. A glue stick is easier for thinner paper in case you need to re-position it. Carefully open your envelope and pull the front of it up as best as you can, to make the gap in the envelope as wide as possible. Slide in your lining and align the fold lines on your two pieces. Press down so they adhere together. That’s all there is to it! I think this is a really great thing to add on to cards and envelopes. If you do create your own cards, you can design envelope liners to match and make a pattern so they both coincide.